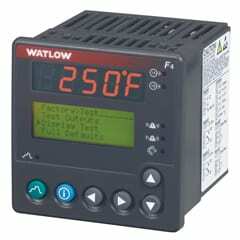 Watlow’s temperature and process controllers offer easy-to-use, accurate and reliable solutions for applications requiring single and multiple loops of control. Temperature and process controllers include one or more sensor inputs with open-loop break detection and multiple outputs for control and alarms. Various configurations offer auxiliary analog inputs, automatic tuning, TRU-TUNE®+ adaptive control, and ramp and soak profiling. 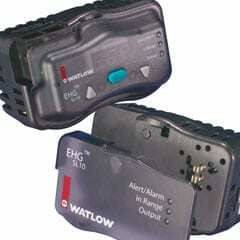 Output options include analog process, switched DC and mechanical, solid state and no-arc hybrid relays. Other features include countdown timer, user-customizable menu, burst fire output control, failed heater/load detection and NEMA 4X (IP65, IP66). EZ-ZONE controllers offer additional features and options including application blocks with timers and counters, on-board data logging, SENSOR GUARD backup to protect loads should a sensor fail, AUTO CLONE™ automatic configuration backup and restore, standard bus communications, wide ambient-temperature operating range, Class I, div 2 rating, SD card expandable memory, USB connectivity and free configuration software. The SERIES F4 1⁄4 DIN industrial ramping temperature controller meets the requirements of the most demanding ramp soak controller processing applications. Easy to set up and operate, the ramp soak controller’s programming features and proven performance capabilities are ideally suited for environmental chamber or furnace and oven applications. Single and dual channel versions are available. Competitively-priced, the SERIES F4 ramping temperature controller features a four line, high-definition LCD interface display for quick and easy profile programming and controller configuration. 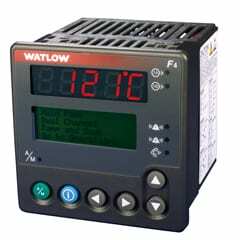 Its 16-bit microprocessor ensures accuracy and delivers performance advantages you can count on from a Watlow controller. The SERIES F4 1⁄4 DIN temperature process controller offers performance features to meet a wide range of industrial processing needs. The F4 process controller is ideal for semiconductor manufacturing equipment, plastic processing and packaging equipment and industrial process control applications. This process controller features a four line, high definition LCD interface display, in addition to an information key that enables easy set up and control operation, minimizing the chance for error. 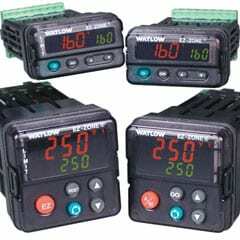 Its 16-bit microprocessor ensures accuracy and delivers performance advantages you can count on from a Watlow controller. Four digital inputs remotely modify controller operation or enable display of pre-defined operator messages. Advanced process controller features include cascade, ratio, differential, duplex slide wire and retransmit options. The F4T with INTUITION temperature process controller from Watlow offers a wide range of field removable I/O modules for maximum design flexibility. Configurations can be custom tailored to meet the scaling needs of a tremendous range of equipment and applications while providing exactly the hardware types required for compatibility. The F4T controller also features a 4.3 inch, color, graphical touch panel. Combining power, flexibility and functionality, this new controller offers unmatched versatility, and its best-in-class ease of use could very well make user manuals a thing of the past. The F4T offers high quality and reliability. Watlow’s family of microprocessor-based temperature controllers offers an economical solution for applications that require simple, on/off control. 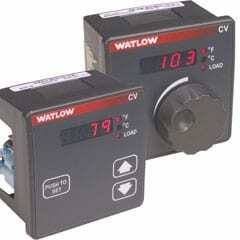 The SERIES CV temperature controller incorporates a microprocessor design that delivers the repeatability, accuracy and performance advantages you can count on from Watlow’s basic temperature controllers. The SERIES CV controller includes an operator interface for viewing and set-point control. A red, four-character, seven segment LED displays the set point to show process options. The setpoint control selection is made with a continuous turn rotary encoder. 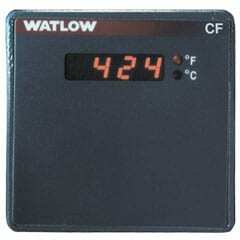 Operating range temperature values are user definable as specified in the product configuration part number. 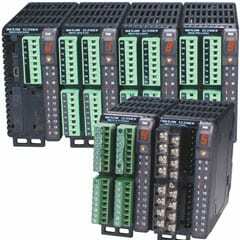 SERIES CV controllers are UL® and C-UL® listed and carry CSA and CE approvals. 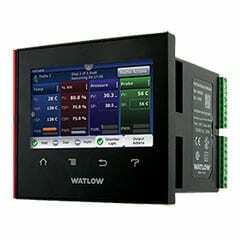 Watlow’s temperature controllers include industry-leading service and support and are protected by a three-year warranty. Watlow’s family of microprocessor-based temperature controllers offers an economical solution for applications that require simple, on-off control. The SERIES CF temperature controllers and set point controllers incorporate a microprocessor design that delivers the repeatability, accuracy and performance advantages you can count on from Watlow’s basic temperature controllers. Fixed set points are available and an indicating display is an option. 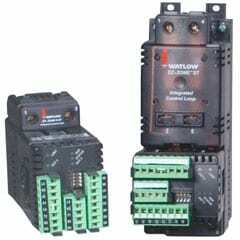 SERIES CF controllers are UL® and C-UL® listed and carry CSA and CE approvals. 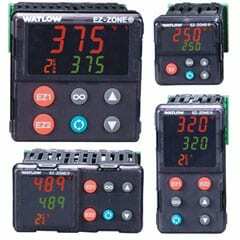 Watlow’s temperature controllers include industry-leading service and support and are protected by a three-year warranty.